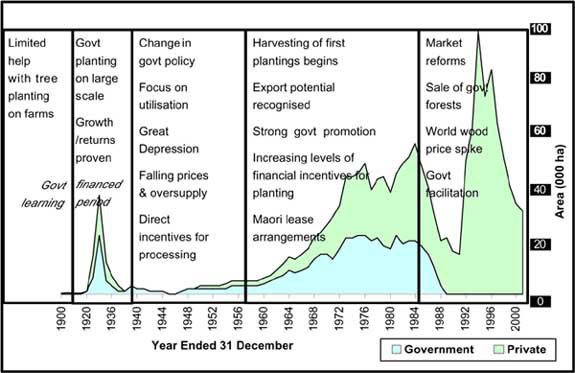 The history of forest plantation development in New Zealand is one of long-term vision, targeted government policies, use of direct and indirect incentives during its development phases, and the ability to quit government involvement once its role had been fulfilled (Figure 5). In the early stages of development, policies, legislation and incentives were focused on establishing a largely government-owned plantation resource to reduce the pressure on indigenous forest. In 1987, after over 60 years of such involvement, the government decided to relinquish its hold on plantation forestry. Direct incentives to forest planting were removed and a government-owned corporation was established to manage government plantations. By 1993, the government sold the bulk of its 0.5 million ha of plantation forests to domestic and overseas bidders. Once direct government incentives had been removed during the reforms of the 1980s in an even-handed way across the economy, within a relatively short time the industry neither expected nor wanted the assistance. Indeed, the replacement of, at times, unpredictable government policy with free-market signals was seen by a mature industry as more sustainable. It was apparent that any move to restore subsidies or other market distorting mechanisms would be firmly opposed. Just as direct incentives played a central role in the establishment of New Zealands plantation forest industry, the absence of direct incentives was equally important in ensuring that a mature, export-oriented industry remained efficient and internationally competitive, and flourished. The government and the forest industry recognize the continuing importance of certain indirect incentives. These focus on the provision and funding (in part) of infrastructure, biosecurity, research, market access initiatives and information, particularly independent and authoritative plantation resource data. Also critical have been the establishment and maintenance of neutral investment and environmental regulatory regimes within which all industries operate on an equal footing. Indirect incentives are generic and not specific to plantation forestry. The history of plantation forest ownership in New Zealand has seen dominance by the government replaced by dominance of the corporate sector. If the recent new planting trend continues, there could be dominance by small-scale plantation forest owners over the next couple of decades. The various types of owners have been motivated by different objectives. The government initially wanted to ensure a sustainable wood supply to meet the nations future needs, and then desired economic development based on an export-oriented industry. The corporate enterprises had to deliver financial returns to their shareholders, while small-scale investors were motivated by a combination of factors (Table 8). Government-led afforestation to demonstrate the biological and commercial successes of this new land use with exotic species on a long production cycle (thus developing the knowledge base and reducing the risks for private enterprises). A commitment to train professional foresters and forest management personnel. Debates and acrimony between the agriculture and forest industries, and the environmental movement and the forest industry, in the 1970s and 1980s, were the major disincentives. These resulted in statutory land-use controls, a poor public perception of the forest industry, and constrained development to some degree. Publication of high-quality forest industry statistics, wood-supply forecasts and other information, often through joint initiatives by the government and private sector, that is essential for good policy development, short-, medium- and long-term planning, and monitoring. A major, but short-term (1987-1991) disincentive was a taxation regime that might have been theoretically neutral, but failed to recognize the long gestation periods, and depressed new planting during its existence. The focus of New Zealands plantation development strategy over the last 15 years has been on managing economic fundamentals (inflation, interest rates and the costs of business undertakings), encouraging enterprises and innovations, and avoiding, remedying or mitigating adverse environmental effects. There is no expectation of, or desire for, change to this approach. Built around an open and market-led economy, the New Zealand plantation forest industry has matured sufficiently to ensure continuing growth and vigour. Improvements in occupational health and safety. The delivery of strategies to address these issues and other supporting functions will continue to require government border control, forest policy and research agencies with appropriately trained staff. A growing and diverse industry will continue to coordinate its input to issue resolution through sector associations and an integrated Forest Industries Council. At the farm forestry level, development will continue to depend on the relative profitability of farming and forestry, the perception of forestry (often gained through the media), the development of certification, and the perception of long-term commercial and non-commercial values associated with trees and wood. Economic statistics reporting the contribution of forestry to the GDP. Lessons can be learned from the successes and failures of incentives in other countries, but ultimately the appropriate combination of policies, strategies and supporting incentives should reflect individual country circumstances, and the national needs and objectives. Consideration must be given to the factors that motivate people to invest in planting trees. Forestry is a long-term investment, and long-term visions and strategies - based on reliable information of resource, product, market supply and demand - are required. There is no universal model for success. New Zealands approach has been highly successful. Much of the impetus provided by the New Zealand Government has been through indirect incentives, particularly research. Such an approach may or may not be successful elsewhere. Allsop, F. 1973. The first fifty years of New Zealand Forest Service. Information Series No.59. Wellington, New Zealand Forest Service. Clarke, M. 1999. Devolving forest ownership through privatization in New Zealand. Unasylva 199, Vol. 50: 35-44. Department of Statistics. 1968. New Zealand official yearbook. Government Printer, Wellington. Director-General of Forests. 1964. Report of the Director-General of Forests for the year ended 31 March 1964. Wellington, Government Printer. Director-General of Forests. 1965. Report of the Director-General of Forests for the year ended 31 March 1965. Wellington, Government Printer. Director-General of Forests. 1966. Report of the Director-General of Forests for the year ended 31 March 1966. Wellington, Government Printer. Director-General of Forests. 1967. Report of the Director-General of Forests for the year ended 31 March 1967. Wellington, Government Printer. Director-General of Forests. 1968. Report of the Director-General of Forests for the year ended 31 March 1968. Wellington, Government Printer. Director-General of Forests. 1982. Report of the Director-General of Forests for the year ended 31 March 1982. Wellington, Government Printer. Director-General of Forests. 1983. Report of the Director-General of Forests for the year ended 31 March 1983. Wellington, Government Printer. Director-General of Forests. 1984. Report of the Director-General of Forests for the year ended 31 March 1984. Wellington, Government Printer. Director-General of Forests. 1985. Report of the Director-General of Forests for the year ended 31 March 1985. Wellington, Government Printer. Durst, P.B., Waggener, T., Enters, T. & Tan, L.C. (eds.). 2001. Forests out of bounds: impacts and effectiveness of logging bans in natural Forests in Asia-Pacific. RAP Publication 2001/08. Bangkok, Food and Agriculture Organization of the United Nations. Kensington, W.C. 1907. The timber industry of New Zealand report. Forestry papers. Kirkland, A. & Berg, P. 1997. A century of state-honed enterprise. 100 years of state plantation forestry in New Zealand. Auckland, Profile Books. McKenzie, G.R. 1997. Forestry encouragement loans, administration and contractual liabilities. Internal report of 13 March 1997, Ministry of Forestry, Wellington. Ministry of Forestry. 1994. Zone Studies. Northland. Wellington, Ministry of Forestry and Agriculture. Ministry of Forestry. 1994. Zone studies. Wairarapa & Wellington. Wellington, Ministry of Forestry and Agriculture. Ministry of Forestry. 1995. Zone studies. Investment opportunities in the New Zealand forest industry. Wellington, Ministry of Forestry. Ministry of Forestry. 1995. Zone studies. Canterbury inland hill country. Wellington, Ministry of Agriculture and Forestry. Ministry of Forestry. 1995. Zone studies. Coastal Bay of Plenty. Wellington, Ministry of Agriculture and Forestry. Ministry of Forestry. 1995. Zone studies. Manawatu & Wanganui. Wellington, Ministry of Agriculture and Forestry. Ministry of Forestry. 1995. Zone studies. Marlborough. Wellington, Ministry of Agriculture and Forestry. Ministry of Forestry. 1995. Zone studies. Nelson. Wellington, Ministry of Agriculture and Forestry. Ministry of Forestry. 1995. Zone studies. North East Otago. Wellington, Ministry of Agriculture and Forestry. Ministry of Forestry. 1995. Zone studies. West Coast. Wellington, Ministry of Agriculture and Forestry. Ministry of Forestry. 1996. Zone studies. Forest growing investment on the east coast. Wellington, Ministry of Forestry and Agriculture. Ministry of Forestry. 1996. Forest growing investment in Hawkes Bay. Wellington, Ministry of Forestry and Agriculture. Ministry of Forestry. 1996. Forest growing investment in the Otago & Southland Uplands. Wellington, Ministry of Forestry and Agriculture. Ministry of Forestry. 1996. Forest growing investment in Taranaki & King Country. Wellington, Ministry of Forestry and Agriculture. Ministry of Forestry. 1997. Indigenous forestry: sustainable management - a guide to plans and permits. Wellington, Ministry of Forestry. Ministry of Forestry and New Zealand Forest Research Institute Limited. 1994. Small forest management 2: forestry joint ventures. Wellington, Ministry of Forestry. Ministry of Forestry and New Zealand Forest Research Institute Limited. 1994. Small forest management 8: marketing a small forest. Wellington, Ministry of Forestry. Ministry of Forestry and New Zealand Forest Research Institute Limited. 1995. Small forest management 1: special purpose timber species. Wellington, Ministry of Forestry. Ministry of Forestry and New Zealand Forest Research Institute Limited. 1995. Small forest management 3: The Resource Management Act. Wellington, Ministry of Forestry. Ministry of Forestry and New Zealand Forest Research Institute Limited. 1995. Small forest management - 4: planning a small forest. Wellington, Ministry of Forestry. Ministry of Forestry and New Zealand Forest Research Institute Limited. 1996. Small forest management - 5: establishing a small forest. Wellington, Ministry of Forestry. Ministry of Forestry and New Zealand Forest Research Institute Limited. 1996. Small forest management - 6: managing a small forest for timber. Wellington, Ministry of Forestry. Ministry of Forestry and New Zealand Forest Research Institute Limited. 1996. Small forest management - 7: harvesting a small forest. Wellington, Ministry of Forestry. Ministry of Forestry and New Zealand Farm Forestry Association. 1998. Indigenous forestry: sustainable management. Wellington, Ministry of Forestry. New Zealand Forest Service. 1986. Statistics of the forests and forest industries of New Zealand to 1985. Wellington, New Zealand Forest Service. OBrien, M.V. 1982. Government incentives to the forestry sector. Report submitted in partial fulfilment of a Bachelor of Management Studies. Hamilton, New Zealand, University of Waikato. Phillips Turner, E. & Beasley, A. 1936. Forestry in New Zealand. In Agricultural organisation in New Zealand. A survey of land utilization, farm organisation finance and marketing. Chapter XXVII. New Zealand Institute of Public Relations. Melbourne University Press. Poole, A.L. 1968. Five year review of the Forestry Encouragement Loans Scheme. Farm Forestry Conference, Christchurch, 17-20 April. Poole, A.L. 1969. Forestry in New Zealand. Auckland, Hodder & Stoughton. Roche, M. 1984. Reactions to scarcity: the management of forest resources in nineteenth century Canterbury, New Zealand. Journal of Forest History. April. Roche, M. 1990. History of New Zealand forestry. Wellington, GP Print Ltd.
Simpson, T.E. 1973. Kauri to radiata. Origin and expansion of the timber industry of New Zealand. Auckland, Hodder and Stoughton. Sutton, W.R.J. 1984. New Zealand experience with radiata pine. The H.R. MacMillan Lectureship in Forestry, 23 February 1984, Vancouver, B.C., Canada.